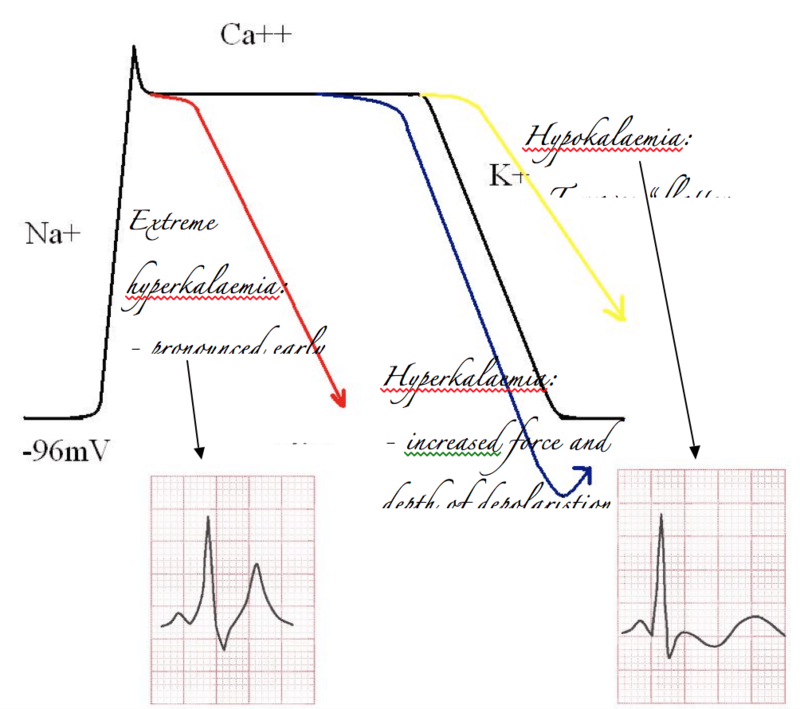 I was talking to a group of my junior registrars the other day about cardiac physiology, and I was struck by how much trouble they seemed to have relating electrolytes to the QRS complex. We sat down and nutted it all out which left everyone happy. 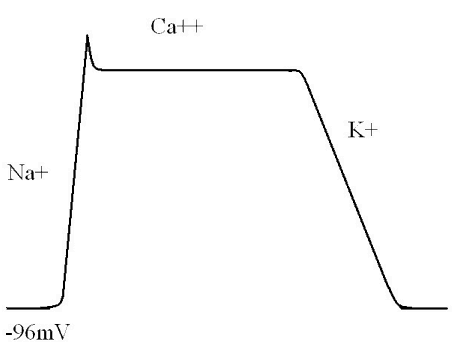 The key to understanding the effects of electrolytes is to understand the cardiac action potential, and how it relates to the QRST complex seen on an ECG. Below is a brief summary of our conversation. Think for a moment about the basic physiology of the cardiac action potential. I want you to forget for a moment about all those messy classifications of phase 0 through to phase IV, and don’t for a moment let the Nernst Equation enter your mind. Chloride doesn’t play much of a role in the cardiac potential so you can forget about it. (“Thank goodness!” I hear you sigh). Remember that Sodium and Calcium predominantly exist in the extracellular space, so when the membrane of a cell becomes permeable to their passage they rush into the cell and give it a large +ve electrical charge. Potassium has the opposite effect. Got that straight in your head? Good. Normally, cardiac myocytes sit with a resting membrane potential of somewhere between -85mV and -95mV. When the cells become excited sodium channels open. There is a massive influx of sodium (remembering it’s a cation) into the cells and a resulting large positive shift in the resting membrane potential. This creates a large positive electrical vector. Such a shift shows up as a large deflection on any device designed to measure electrical current, such as an ampere-meter or an ECG recorder. I’ve skipped “phase 1” of the action potential, because it’s got a lot of technical details that aren’t really relevant to what we’re talking about. Once the sodium channels have finished working their magic, calcium channels take up the cudgel and open up. This means that the large positive charge of the cardiac membrane is essentially maintained at level. This manifests as a flat line, or plateau phase. Because there is no major change in the charge of the membrane, there is nothing for our device to measure, and this phase will manifest as a straight line. Eventually, calcium influx slows, and potassium channels open, repolarising the heart. This lowers the membrane potential back to its resting levels, and manifests as a large electrical change that can be measured on a current recorder. The ECG is the sum of millions of myocytes. Once you’ve got your head around that concept, understanding the ECG in relation to the action potential is relatively easy. 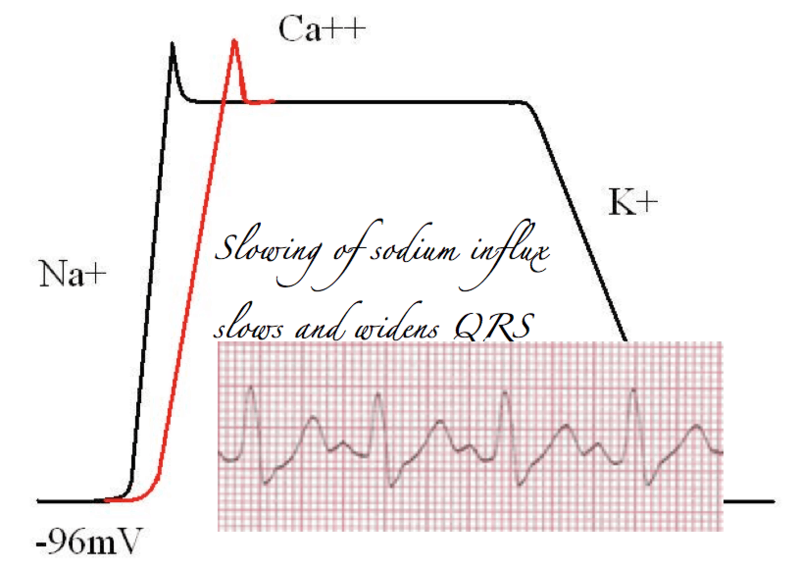 In other words, the QRS complex is the product of sodium channel opening in cardiac myoctyes. If you’re still following, you’ll realise that after the sodium channels have finished their business and the calcium channels open, this results in a long period of non-measurable electrical stability, straight after the QRS complex. That’s right, I’m talking about the ST segment. It’s the “calcium” bit of cardiac conduction. The final part should be obvious. As we’ve already described, the influx of K+ when the right channels open causes another large electrical spike, manifesting on the ECG as a T wave. This is why medical students are often told to remember that the T wave is “full of K+“. So, what does this have to do with electrolytes? One of the hardest things to do is to remember what the effects of different electrolyte imbalances are on the ECG. But, if you remember the basic physiology of electrolytes, it’s dead simple. Block sodium channels, and the rate of rise of sodium influx is slowed. This means muscle contractions will take longer and prolong the QRS. Thus, particularly from a toxicology perspective, prolongation of the QRS, should alert the astute reader of an ECG to the presence of sodium channel blockade. Alternatively, if you’ve got too much potassium on board it’s easy to predict that the influx of potassium will be more impressive than it otherwise would. Therefore the repolarisation curve will be steeper than normal, and overshoot. This will increase the size and volume of the electrical deflection measured on the ECG, which is of course the T wave. In extreme cases this will cause very early repolarisation, and at the same time an increase in basal K+ exchange across the membrane will slow the rate of sodium induced depolarisation. A sinusoidal waveform develops. The opposite effect occurs with hypokalaemia. Depolarisation is less impressive, and T waves “flatten out”. – Calcium transport affects potassium transport. More calcium causes bigger shifts in potassium, and may cause earlier depolarisation. That all seems a bit long winded! 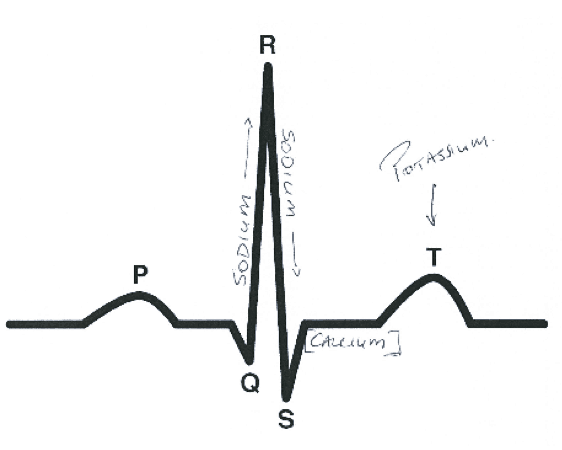 Sodium is the primary ion affecting the QRS complex. If there is a QT abnormality, you should check a serum calcium!